You must have an OR12 Side Planer AND two OR16 (Red) Pro Clips that you previously purchased in order to use this Economy Kit for converting your OR12 to a Tattle Flag Board as they are NOT supplied with this item. Without these items, IT WILL NOT WORK. 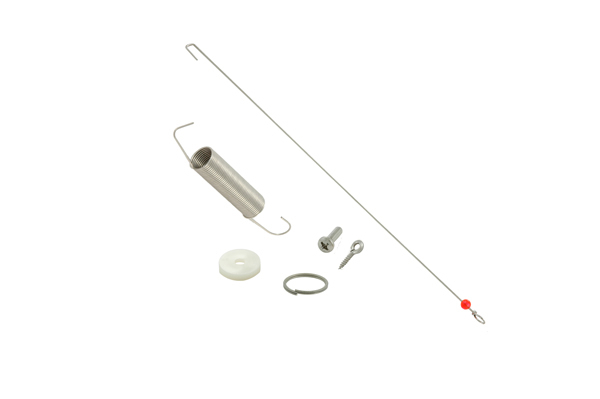 Each kit includes Wire, spring, washer, screw eye, split ring, 6/32 screw and limited instructions. One kit will upgrade one OR12 Side Planer with the two OR16’s you purchased previously. This item is ideal for light biting fish. The flag will pull down when you have a fish on or if you are fouled in weeds.